Exercise for a good cause! All this month, the UN Foundation has been working with a social good app called Charity Miles to help raise money through exercise. It's called the #VDay10K and it's a brilliant campaign to help those who need it while we run or ride a bike! It's through a free app, for iphone or android, that allows you to choose from a variety of charities after you have run, walk, or ridden a bike. The miles you have conquered will be translated into dollars for Shot at Life: an organization that gives life saving vaccines, the Nothing but Nets Campaign: which distributes nets woven with insecticide to protect a family of three for three years from malaria ridden mosquitos, and Girl Up: an organization that provides education to girls in third world countries. The Nothing but Nets campaign really speaks to me. I looked for how to donate, and you can donate any amount at any time and set up a recurring donation! Every 60 seconds, a child dies from malaria, but it is completely preventable and you can help! It costs only $10 to deliver and educate the recipient on how to use it! Charity Miles will donate 25cents for every mile you walk, and 10cents for every mile you bike, so you better get going! you pass the funeral home on the way to the grocery store. you end up in line behind the guy who buried your child, at the gas station. you notice the freshly dug earth at the baby cemetery. but it's not long before you find each other and become friends. you pass the playground dedicated to your angel, every day to and from work. you are surrounded by memories. but that does not make it an awful place to live. It makes it a place where your angel left his mark. Those memories will always be there, reminding you of the good, the bad, the happy and the sad. I received this email last week from a mom of twins, both born with CHD's. It is incredibly hard to read an email from someone you have never met, sharing their story of CHD diagnosis and child loss. At the same time though, I am thankful that by finding my story that they feel " a little less alone". Hi, I saw your story posted today on Facebook. One of our twin daughters was born with 3 CHDs. I, too went to full term in my pregnancy and delivered via c-section. I had many ultrasounds and no complications. We conceived via IVF after not being able to get pregnant for 7 yrs. On the day I delivered (May 26th 2011) they discovered a murmur in Riley and ran the pulse ox screening and an EKG but all was normal. They discharged us 3 days later and said we will see you at your 2 week check up unless something changes. No sense of urgency, no reason to worry, I mean why? They were so casual about it all and made us believe everything was fine. No list of things to watch for or anything. Other than some slight bluing of her hands and feet, she didn't seem any different than her twin sister Reagan. Day 8 of Riley's life, she began to have very labored breathing and that is when we had a gut feeling something wasn't right; we made a phone call to the on-call nurses and they directed us to the ER. That is when our life turned upside down. After 3 hours of trying to determine what the issue was, it was found on an X-ray that her heart was swollen to 80% of her chest cavity. 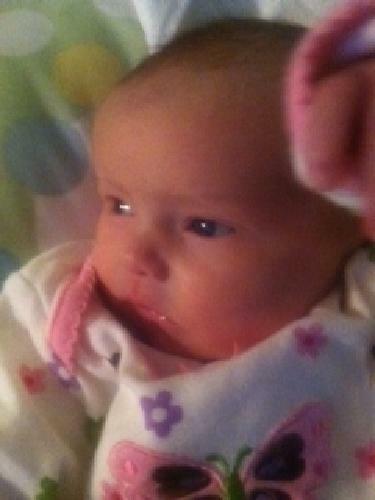 They intubated her then started a line through her umbilical cord since her veins were useless. After rushing her to the local children's hospital in Portland, we learned after an echo, that she also had an interrupted aortic arch, a pulmonary window, and an ASD. She would not have made it through the night had we not brought her in when we did. We baptized the girls together the next day and then Riley had surgery on Day 11 of her life. She had complications with extra bleeding after the surgery but overall her repairs went very well, and they left her chest open for possible swelling. She had complications with fluid in her lungs and other build up which added extra time before she could be extubated. She eventually continued in the right direction. Other than some minor, but very manageable issues with her lungs, she was recovering well. We struggled with some feedings but overall was moving in the right direction. Lots of echos and X-rays that were very good results and she was off all the monitors. They decided she was ready to go home and was ahead of the curve as it related to recovery. The cardiac team is very conservative so if they felt she was ready, she was ready even if 10 days post surgery. We packed her up and brought her home to join her twin sister at home. We got a few pictures did a feeding that went well. We held her a lot and tried to do the next feeding and she struggled a little. I decided to nap with her while my mother napped with Reagan. Riley woke up from her nap crying and I picked her up and noticed her lips looked a little translucent and grey. I thought I was being overly sensitive, grabbed my hospital folder of things to look for, symptoms of concern and didn't see anything that looked like Riley. I kept looking at her and she would look okay, then not okay... sleepy and then crying a little, grayish lips, not grayish lips....this went on for about 10 minutes. I decided to call my husband who was about an hour a way working that day and telling him what I was seeing and the she was breathing a little differently, then sleeping, this rotated for another 5 min or so. I lost connection with my husband and when he called me back moments later, I noticed that Riley wasn't moving and wasn't breathing. I immediately hung up and ran with her in my arms to my mother and that's when I called 911 and started to administer CPR. The whole time I was performing CPR, I knew in my heart that she was gone. She was gone in my arms minutes earlier. After the hospital ER trying to save her for another hour, we all knew it was over. I was not equipped to know how to help her or even to recognize what was happening. Not after she was born or even after we were discharged that day. We did have an autopsy and learned that it was very difficult for them to clearly determine cause of death. Her heart repairs were intact, however her lungs were full of fluid. Most intelligent cause of death was pulmonary hypertension. Her cardiologist almost but assured me that if we were in the hospital, there may not have been anything that could have been done in her case. Her death was super surprising to the whole PICU staff and the cardio team and her surgeon. They felt confident this would have been her only surgery, she was given a 95% success rate. Like you, having another child is a challenge and a blessing. However, my other child is her twin sister. We left the ER that day without our baby to walking into our home and be handed Reagan. I truly don't know what I would have done during this very dark time or would be today without her. We did find out that Reagan also has CHD's- a very small ASD and slight pulmonary stenosis. Neither will ever require surgery or are life threatening so we just monitor it with Echo screenings every 6-12 months. They have been progressively resolving themselves as the cardiologist predicted, so hopefully it never becomes something serious. However both occurrences with the girls are random, nothing genetic. I am still very worried about having more children though. I have to give that to God and let Him lead us in this avenue. Overall, my husband and I are doing fairly well. However, my husband has struggled with depression and anxiety ever since. This was foreign for us as well. He had a serious panic attack about 1 month after her death. Our faith has been our foundation. My husband was no where near as strong in his faith before this event but has transformed in more ways than one. But the continued depression and anxiety has made everyday functioning very challenging for him. No one, even our therapists and support groups can understand why he is emotionally affected in comparison to me, but I think it is just another part of Gods plan. He is all knowing and we trust in his grace and mercy in the life. We know He has Riley and she is in zero pain and is whole again. But we really wish we could have her with us here. Part of this journey is the loss of the dream of my twin girls in life and all that would have been a part of that experience. I have been reading a lot of stories of other CHD babies and truthfully, I can't believe how different life could have been with her here. It may not have been the dream I had in my head, she may not have been normal like her sister Reagan. Thank you for putting your story out there. Many times I feel so alone. It seems like things work out for other families that may be affected by CHD, but it didn't for us. Also, I haven't met another person that had a baby with an interrupted aortic arch. It may just been the medical term for it that I don't recognize but I felt a little less alone today. If you are a parent of a child born with an IAA, please comment below and share your story with this mom; let her know she can always find comfort and support and never feel alone again. I was asked today how I was doing, more then once; which doesn't bother me, but it is a hard question to answer. There is no short answer. So I just smile and say ok. I feel like I've gotten off track. Like I'm not saying the right things or wasting time when there are more important things out there for me to do. I'm not sure...I feel sort of lost. Disconnected is a better word. Disconnected from Corbin. I need to get back to the real me, the emotional, the raw me. I have been rereading through those days. Those days when I would sit and write for hours upon hours, spilling out how I really feel. Not what people want to hear, but the raw truth that they need to hear. I feel like I'm saying the same thing over, and over, and over...and no one is listening. Sure, it has good intentions behind it and it is important information but it's not full of soul anymore. I need that soul back. Writing was, IS, so therapeutic for me. Writing has gotten me through the hardest time of my life and has helped me get out those ugly feelings that other people needed to hear to know they are not the only one's thinking it. Today is Corbin's second birthday. I called into a radio station the second I heard they were wanting to hear birthday shout outs. The DJ asked more questions then I was expecting, but I was pleased he didn't try to hurry me off the phone. This question always irks me. It is not "was", it "IS" his name. His name IS Corbin. He IS my son. I first dealt with the question when making funeral arrangements. The funeral director asked me the same thing and I looked at him and firmly said "His name IS Corbin." We had a balloon release for Corbin at his grave site. We had a balloon release and I forgot AGAIN, for the second year in a row, to put a memory card in my camera. It's a DSLR and doesn't have an internal memory so I didn't get a single shot recorded. BUT my hubby did also take pictures, so I at least have a few to share with you. I attached one of those 5x7 CHD fact printables I made, then wrote a note on the back in case someone found it. Monkey in his monkey hat, saying happy birthday to his little brother. You can see the golden light from the setting sun..I treasure sunsets more after Corbin. Through an amazing non profit called KaBOOM!, you have the chance to win some playground equipment for your community! Coming from a very small town, I can see how important having a play space is for local kids and parents. We are lucky enough to have some great playgrounds here, but they are also small and some are outdated. KaBOOM! started when it's founder, at 24 years old Darrell Hammond read an article about two kids that suffocated while playing in an abandoned car because they didn't have anywhere else to play. He decided to take action and prevent that from happening to any other child. Since it's founding in 1995, KaBOOM! has raised over $200 million, has served over 6 million kids, and has built over 14,000 playgrounds. They are holding a giveaway right now (the deadline is tomorrow, the 19th!!) 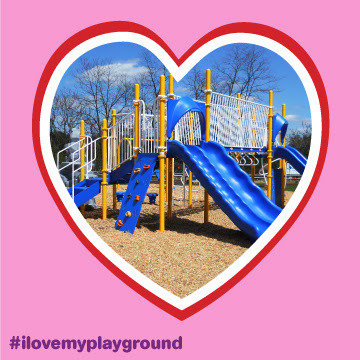 and are asking those interested to post a picture of a playground you love, with the hashtag #ilovemyplayground; you will be entered to win some great prizes! Today is Congenital Heart Defect Awareness day! I am sharing the story of a little boy that could have died at home, if not for a simple, painless, and non invasive test called pulse ox. Hi, my name is Michele and here is my son Dylan's story: When I was 13 weeks along and having my "nuchal fold" ultrasound they found a spinal anomaly. At the time he was so young and they thought that it could have been just how he was turned in the womb and they were not too concerned. I came back two weeks later and they confirmed that there was indeed something going on with the spine. I was then referred to Children's National Medical Center (CNMC) in Washington, DC to have a more complete ultrasound. After out initial scan at CNMC they told us that Dylan had what was called a hemi-vertebrae. Everything else looked normal and he continued to grow as expected. We were followed up at Children's for the rest of my pregnancy and because this abnormality was not life threatening and everything else looked fine, I was cleared to deliver at the hospital of my choice with no intervention. 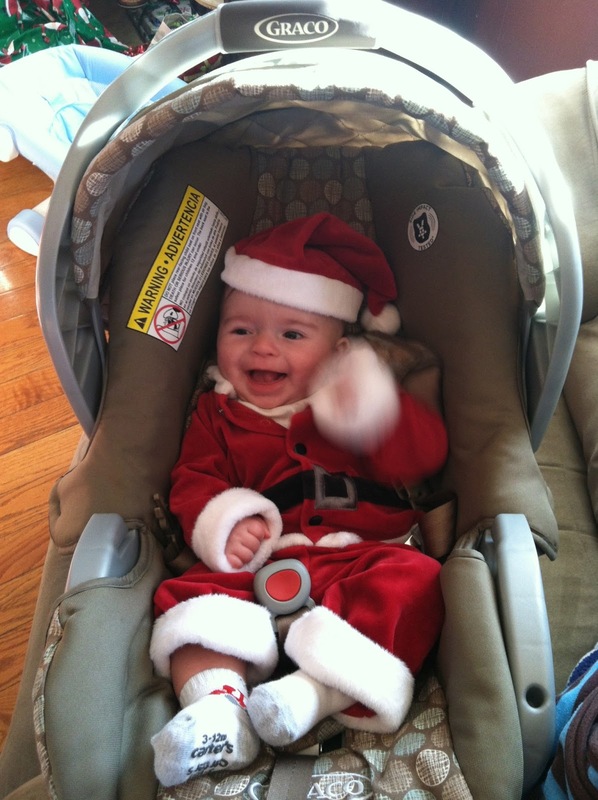 Dylan was born on Thursday December 6th in the late morning at Holy Cross Hospital in Silver Spring, Maryland. He was full term and had an unremarkable delivery. There was a neonatologist present at the birth, because of the pre-existing knowledge of the hemi-vertebrae, and he checked out fine. We had two "normal" days in the hospital and were gearing up to go home. Early in the morning the pediatrician who was on call that Saturday came to talk to us, and I assumed to give us the green light to be discharged. How wrong I was. She told us that he had had an abnormal Critical Congenital Heart Defect (CCHD) screening result. This is a pulse oximetry test that measures the oxygen saturation in the blood. His saturation was 100% in his upper extremities and between 82% and 86% in his lower. She was not overly concerned and even told us that is was probably nothing and that his body was just regulating. She wanted to be sure though and asked that we stay to have an Echocardiogram performed. Since it was a Saturday and there was nobody on staff at Holy Cross to do the Echo, we had to wait for a cardiologist who was on call in Northern Virginia to finish and make his way to Maryland. About 6 hours later, he showed up and within 5 minutes of the Echo being over Dylan was whisked away to the NICU. My mind was spinning. We were packed, I was dressed, Dylan was dressed and we were supposed to going home. Now I was told that Dylan was born with multiple Congenital Heart Defects and would have to have open heart surgery soon or he would die. I was alone hearing this news as my husband had to leave to go get our 2.5 year old son from the babysitter. As I sat in the conference room with the neonatologist, with my husband on speakerphone, listening to him explain what was wrong and what they were doing now, I thought that this could not be my life. Just a few hours earlier, we had everything going right, and now our sweet baby was going to be cut open and have major surgery. Within a few hours of being sent to the NICU at Holy Cross, the transfer team from CNMC arrived to take Dylan to their hospital to figure out our next steps. Dylan had 3 issues going on in his heart. 2 really bad and one kind of bad but in Dylan's case, good. He had an interrupted aortic arch (which meant no oxygenated blood was traveling to his lower extremities) and an aorta pulmonary window (which is an opening in the pulmonary vein and the ascending aorta so there was mixing of oxygenated blood and unoxygenated blood). The good thing was that there is a vessel that is open in utero and closes soon after birth (the Ductus Arterosis) that for some reason did not close that quickly. This is the only way that any blood was reaching the lower part of Dylan's body. When he arrived in the NICU at Holy Cross he was immediatly statred on a drug called Prostaglandin. This drug was keeping the Ductus Arteriosis open and buying him time to get to the operating room. 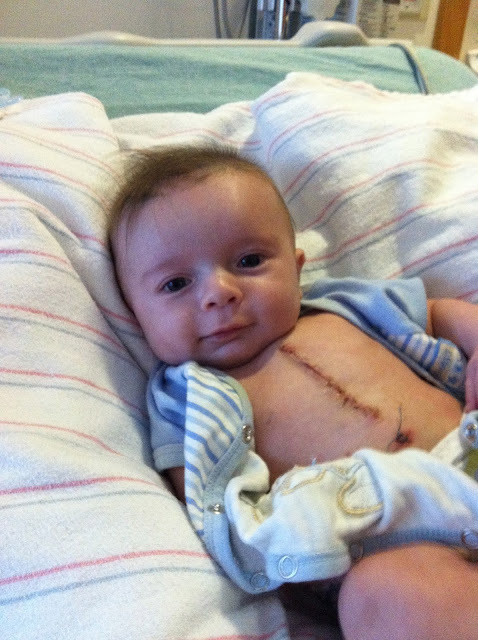 On Thursday December 13th, 7 days after he was born, Dylan had open heart surgery to repair the 3 defects. We left Dylan in the pre-op area with the anastesesia team around 8:15 am and then just had to wait. We were given a pager and were able to wait back in his room in the CICU (cardiac intensive care unit). The sent 4 updates total and at 12:26 pm we got a text that he was off bypass and his surgeon, Dr. Sinha, would be out soon to talk to us. The moments it took from the time we saw him and the time we were seated in the consultation room hearing "everything went fine" we're the longest and most stressful I had experienced to that time. He said that Dylan did great. He was on bypass for just over an hour and circarrest (no blood to the brain) for only about 15 minutes which is excellent. He said that the next 24 hours were going to be the most critical and if he made it though the night he would feel much better about his recovery. The next 24 hours were indeed hard and they were definitely the most stressful of my life. All of the moments of the past week that I though were bad, were NOTHING compared to this. I consider myself incredibly strong and I never back down from anything but I actually had to go home from the hospital because I was unable to handle the ups and downs that post-op was presenting. Dylan is also incredibly strong and he fought and fought and survived. He was in the hospital relearning how to breathe and eat for another 15 days and on December 30th we were released from the hospital and were headed home!! He is doing really, really well at home and if you didn't know any better, you would think nothing had ever happened to him. At his 6 week post-op visit with his Cardiologist she said that everything looks great and his heart is fully repaired. There is nothing leftover from the surgery to worry about. She said that all I needed to do now was to love him and watch him grow! He will probably have to have another surgery to repair the hemi-vertabrae in about a year but that is another story, for another blog. We are so grateful for all of the staff at Holy Cross and CNMC. Everyone did their jobs and we were definitely in the right place at the right time. If I had delivered in DC, where I live, this story could be very different. The CCHD screening is not mandatory in DC hospitals and Dylan would have most likely been discharged. We were told that if we had been discharged the he would have gotten sicker and sicker and either would have died of heart failure at home, or we would have been able to get him to the hospital but our options would have been limited because of the stress his body had been under. We are especially thankful for the on call pediatrician that Saturday. She is the one who made the call to keep us there and to follow the newly implemented protocol. The CCHD screening told her there was a problem and she acted. We are grateful for everyone who has worked so hard to get the CCHD screening legislation passed in 7 states and the others that are still in process. Thank you, thank you, thank you. This may be the last day of CHD awareness week, but that does not mean the awareness stops! Keep sharing, keep talking to your friends, keep handing out fliers; keep spreading awareness and we can save lives together! Share this post- you never know who may see it and because of reading it, ask for a pulse ox on their baby. It is frightening how fast your life can change with hearing 4 words. 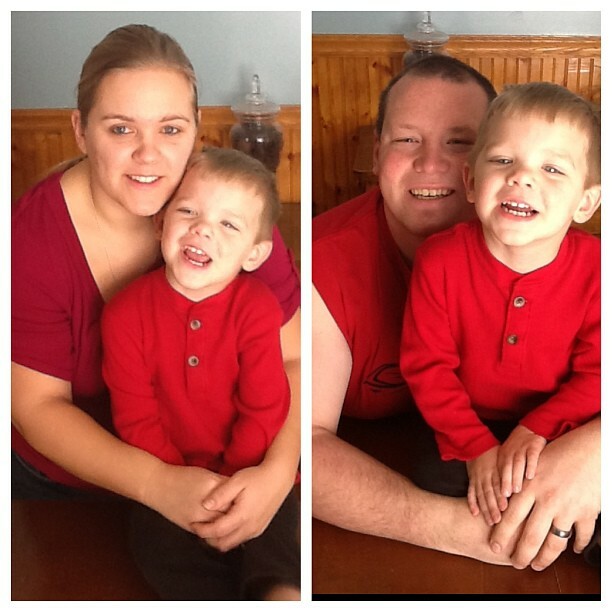 I heard the same when I had Corbin; here is another mother's story of her son's CHD diagnosis. Our lives were shattered with the utter of four little words, “I hear a murmur.” As our pediatrician looked up from our two week old son and began to explain how I needed to take Logan down the hallway for a few tests I found myself in complete shock. In total disbelief that this was even happening, I felt numb. I simply followed orders and walked down the hallway with my mom to get Logan an EKG and chest x-ray. What was supposed to be a happy day, filled with our new baby boy’s two week well child checkup; a photo session with our three year old and his baby brother, and fun time with Grandma, quickly turned into every parent’s worst nightmare. When the tests were complete we returned to the office to await the results. Making the phone call to my husband who was at work was not only emotional but very difficult. When Logan was five weeks old he had his first heart surgery, the BT Shunt. Handing my baby over again to the arms of strangers was incredibly hard. I was a wreck the entire time he was in surgery and praying that he would make it out. Several hours later he did and seeing him for the first time after surgery was quite traumatic. They show you pictures in a book prior to surgery to try and help you to cope with all of the things you are going to see post op but it doesn’t even come close to what it is actually going to be like. The many, many machines pumping lifesaving mediations through his body, the ventilator helping him breath, the shocking scar running down his chest, the constant beeping of monitors, chest tubes protruding from his chest, and his little lifeless body laying there unable to move or open those big brown eyes. It was absolute torture not being able to pick him up and swaddle him in my arms. Logan endured his third heart surgery when he was three years old to replace his conduit and remove a muscular growth from his right ventricular outflow tract. This surgery was one of the hardest for me personally. It was very different than handing over my baby that I barely knew. This was my sweet little boy who kissed me, hugged me, shared with me his sunny little personality and was the light of my life. The thought of having that ripped away from me was agonizing. But Logan once again pulled through his surgery and recovery despite suffering a surgical complication known as Dressler’s Syndrome which causes fluid to develop around the heart along with other symptoms. Since then Logan has grown into a vibrant free spirited six year old little boy who lives each day to the fullest. He is sweet, silly and funny. Looking at him now you would have no idea all of the things he has been through the past six years. He started kindergarten this year and has been busy making friends, something he has wanted for so long. 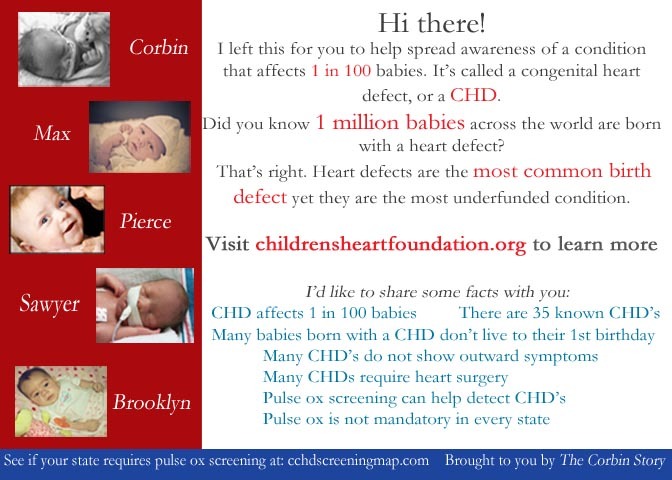 In honor of CHD awareness week, I will be sharing a few stories from Heart parents to help show the world how important CHD awareness is and the need for pulse ox screening. 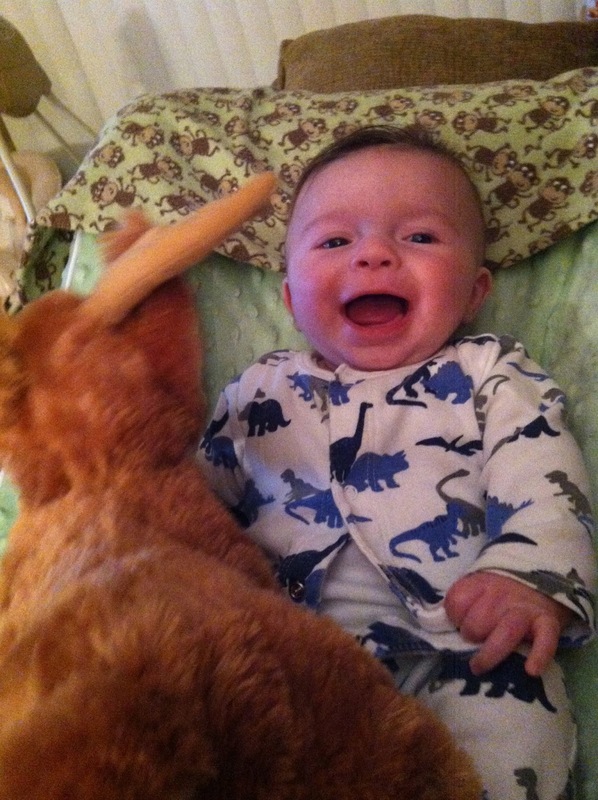 Read how baby Joey is helping to do just that. My name is Sarah Powling, and this is the story of my son, Joey. couldn't handle. Joe and I were so eager and thrilled to start our own family. it bother me too much, though, and I continued on with my daily life. what was the point of rushing. If I had only known what was in store for us. but for my husband and me, this feeling came early and very unexpectedly. As I lay on the table for my level 2 ultra sound, I watched the monitor closely. even wrap my mind around what was happening! confirm that Joey had a heart defect known as Tetralogy of Fallot (TOF). pregnancy had soon turned into complete anxiety. decided that I would be induced at 37 weeks. The date was July 27, 2012.
immediately taken to the corner of the room with several doctors from the NICU. minutes before they brought him to the NICU. can ever describe how much everyone’s support meant. they kidding? Nope. Luckily Joey was such a good baby, and he really didn’t cry. Thank God, because I don’t know how we would have handled it if he did.Joey was home for 3 months before he had his open-heart surgery. He never turned blue! He was hospitalized several times because he got dehydrated and his stats weren't as good as they should have been. That is why Joe and I were so relieved when it was time for his surgery. such a relief to know that he had been fixed. they are; however, they were right where the cut was supposed to be made. widened as much as they had hoped. though, his was 77%, so his operation was definitely a success. Facebook page, which I keep private, for family and friends to see it. still didn't think much of it and said sure, as long as he didn't give any personal information. and is always smiling and laughing. We are so lucky that he is ours! spreading awareness for heart defects. and I are proud to be his parents, and we are happy to share his story. to thank you for reading our story! Today is Go Red day and I am LOVING the flood of red photos all over Facebook. I know Go Red is really dedicated to heart health for women, but it's also a time to spread CHD awareness so I take advantage of that! -Hand out CHD postcards with facts and a link to more information, put them in random places for people to find like on a vending machine or leave in a buggy at the grocery story.